U.S. Sens. Al Franken and Richard Blumenthal on Wednesday introduced legislation that would require companies like Apple, as well as application developers for platforms like iOS, to receive express consent from users before collecting or sharing location information. Franken (D-Minn.) and Blumenthal (D-Conn.) singled out both Apple and Google in a press release sent out Wednesday to announce the new legislation. The bill, called the "Location Privacy Protection Act of 2011," aims to close what the senators view as loopholes in current federal law. The proposed law would cover both device manufacturers and application developers, and would apply to both smartphones and tablets. The senators said that the new law would ensure consumers know what location information is collected about them, and would allow users to decide if they want the information to be shared. 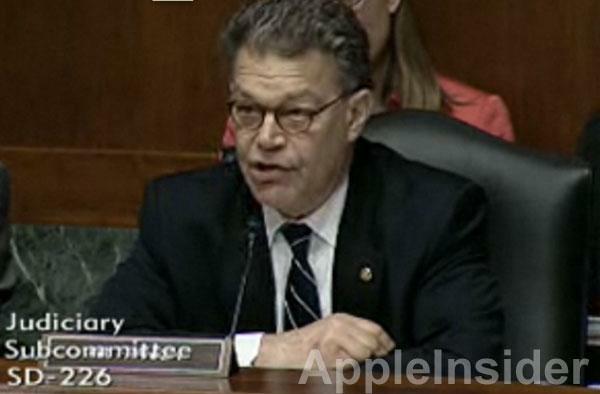 "Our laws do too little to protect information on our mobile devices, Franken said in a statement. "Geolocation technology gives us incredible benefits, but the same information that allows emergency responders to locate us when we're in trouble is not necessarily information all of us want to share with the rest of the world. "This legislation would give people the right to know what geolocation data is being collected about them and ensure they give their consent before it's shared with others." Franken, who is chairman of the Judiciary Subcommittee on Privacy, held a hearing in May that was attended by representatives of both Apple and Google. At that hearing, Apple's vice president of software technology, Bud Tribble, said that Apple does not track users' locations, and does not personally share identifiable information with third parties for marketing purposes without a user's consent. He also restated what Apple revealed in April: that Apple collects information about the locations of Wi-Fi hotspots and cell towers to expedite identification of a user's location. This information is anonymously collected with the sole purpose of improving Apple's services. A file labeled "consolidated.db" gained significant attention when a pair of security researchers discovered that it contained an extensive database of location coordinates in an unsecured file. Apple quickly addressed the issue with an iOS software update. "This legislation is a strong step toward ensuring that consumers' geolocation information is protected from being collected and stored without their consent," Blumenthaln said in a statement. "As smartphone technology continues to advance, it is vitally important that we keep pace with new developments to make sure consumer data is secure from being shared or sold without proper notification to consumers." The new bill is supported by the Center for Democracy and Technology, Consumers Union, the National Association of Consumer Advocates, the National Center for Victims of Crime, National Consumers League, the National Network to End Domestic Violence, the National Womens Law Center, and the Minnesota Public Interest Research Group.